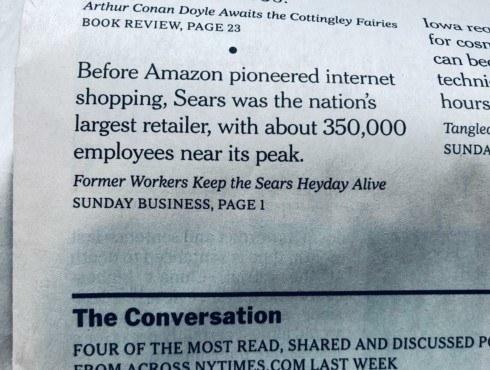 Before Amazon, there was Sears with 350,000 employees reports today’s Times. A key difference between the two is that Sears provided quality benefits and wages to employees, Sears paid more per sale in taxes (aka helped local schools more), and Sears’ reach was largely limited to its immediate stores’ locations. Since there was no the Internet, the Sears catalog’s impact was limited.